Can you say mega-regatta? That’s an apt description for Sperry Top-Sider Charleston Race Week, to be sailed April 16-19, 2015. With some 300 boats expected to compete and roughly 2,500 competitors descending upon Charleston, SC, it’s definitely big. But big isn’t the only attribute. Charleston’s premier regatta, now celebrating its 20th year, has always distinguished itself in substantive ways. This year, the event organizers have arranged to offer live streaming of the on-the-water action courtesy of title sponsor Sperry. And, to increase the event’s visibility, the organizers are also hoping to have big screens in strategic areas around downtown Charleston carrying the live feed. In addition, they’re working with the Volvo Ocean Race to offer live streaming of the start of Leg 6 on Sunday, April 19. But those are just a few of the shoreside frills. On the water, competitors will see a couple of new classes in action, including the VX One Design, the J/88, the C&C 30 and the Farr 280. Those last three will be accommodated on a second offshore racecourse, and to keep things interesting, those and the other offshore one-design classes will finish the last race of each day on a longer leg back through the jetties and into the harbor. Southern hospitality has long been a hallmark of this event, and that hasn’t changed. There will be plenty of Gosling’s Rum at the post race parties each evening, along with sumptuous meals on three nights. Each morning, the US Sailing Espresso Bar will be cranking out high-octane caffeine beverages. Couple all of that with intense on-the-water competition in the nation’s Number 1 tourist destination (according to the readers of Condé Nast Traveler) and what’s not to like? Best of all, it’s not too late to register. 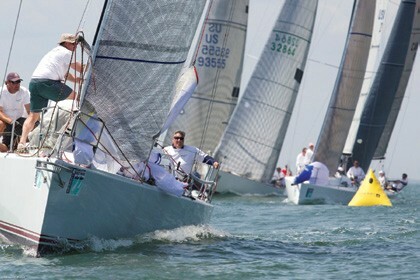 Whether you’re a one-design sailor, a PHRF racer, or an ORR aficionado, all you have to do is go sign up at charlestonraceweek.com. What will be the next Junior Trainer?